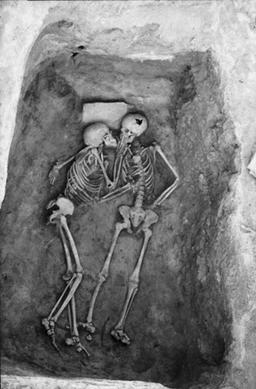 The image depicts two human skeletons, seemingly in an embrace, which earned the photograph its title Hasanlu Lovers or The 2800 Years Old Kiss. The skeleton on the right is lying on its back. Dental evidence suggest this was a young adult, possibly 19-22 years of age. The pelvis indicates a male. Health appears to have been good with no apparent evidence of healed lifetime injuries. The skeleton on the left is lying on its left side. It has been aged to about 30-35 years. Evidence of gender leans towards male. Health appears to have been good with no apparent evidence of healed lifetime injuries. The pair of skeletons were found in a bin-like structure with no other objects except a stone slab under the head of one skeleton. They died together around 800 B.C., during the destruction of the Teppe Hasanlu citadel. Isotopic signatures indicate that the diets of the residents of Hasanlu were varied, indicating a diet comprising wheat and barley, sheep and goats, and that the residents of Hasanlu were largely born and raised in the area. ^ a b Dandamaev, M. A. (1989). The Culture and Social Institutions of Ancient Iran. Cambridge; New York City: Cambridge University Press. ISBN 978-0521321075. ^ a b c d Dyson, Jr., Robert H. (1973). "Survey of Excavations in Iran 1971–72". Iran: Journal of the British Institute of Persian Studies. 11: 195. JSTOR 4300498. ^ a b "The Lovers - Hasanlu". Penn Museum. Retrieved 31 October 2017. ^ Ellsworth, Amy. "Penn Museum Blog". Penn Museum. p. 20. Retrieved 12 October 2014. This article relating to archaeology in the Near East is a stub. You can help Wikipedia by expanding it. This page was last edited on 5 February 2019, at 02:00 (UTC).